In the two decades before Flanders became the fashionable place to kill and be killed, many plucky young fellows thought the Arctic quite the best location in which to seek gruesome, manly death. The barren wastes provided a romantic backdrop, the remoteness was insurance against the indignity of rescue, and death was often protracted enough to allow for the writing of long, heroic diaries. For the older or less sporty explorer, worried about his ability to manhaul stupidly heavy sledges over unstable icefields in the pursuit of science/immortality, floating over the North Pole in a dirigible seemed like an excellent notion. Luckily for them, the Arctic air-race provided as much opportunity for pointless tragedy as the land-race famously did. Andree’s main skill lay in the growing of an excellent moustache. The very first attempt to reach the North Pole by air was the brainchild of the psychotically optimistic Swedish engineer, Salomon August Andrée. Founder of the Society of Swedish Inventors and Chief Engineer of the Stockholm Patent Office, he was known for his Swedish stubbornness (see Charles XII), hard work and blinding belief in the power of science. 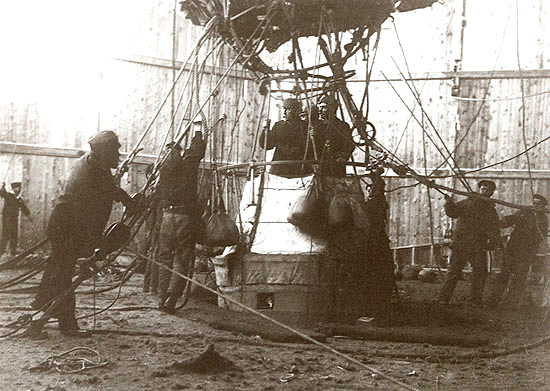 Andrée’s balloon Örnen was a 20 metre wide spherical hydrogen balloon, and therefore intrinsically unsteerable. 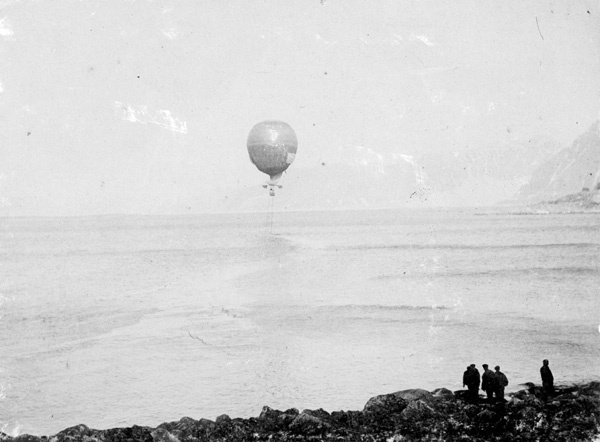 Andrée attempted to change this by attaching heavy drag ropes to slow the balloon to sub-windspeed, and a sail which could then catch the wind. His test flights over Sweden had proved two things: firstly that Andrée was the kind of navigator capable of mistaking the Baltic for an especially large lake; and secondly that drag ropes are fickle, willful creatures, prone to tangling up, falling off or getting stuck in things. There was little evidence that the drag ropes and sail had any effect on direction of travel. Despite this painfully gathered experimental data and his extensive scientific training, Andrée persuaded himself and a large number of patriotic Swedes, including King Oscar and superstar-scientist Alfred Nobel, that a trip to the Pole was a Good Idea. Since he was the only person in Sweden who really knew much about ballooning (it being a whimsical French pastime), there was no one to tell him just how very optimistic he was being. Balloon testing provided more data for Andrée to ignore. 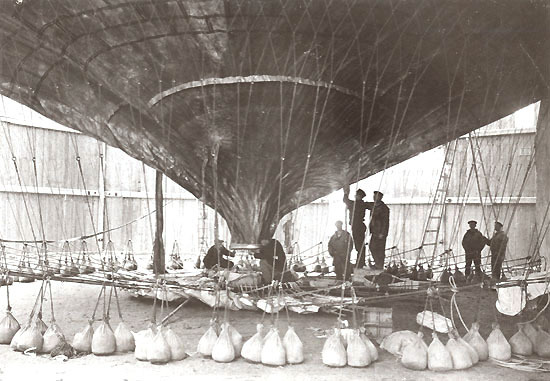 Örnen was manufactured in Paris by Henri Lachambre, (who also made balloons for Santos-Dumont) and delivered untested to Svalbard in 1896. When Andrée’s crew-mate Nils Ekholm inflated the balloon and tested it for leakage, he found that it was losing 68 kg of lift per day, and was incapable of staying airborne long enough to reach the Pole, let alone for the 30 days needed to fly on to Russia or Canada. 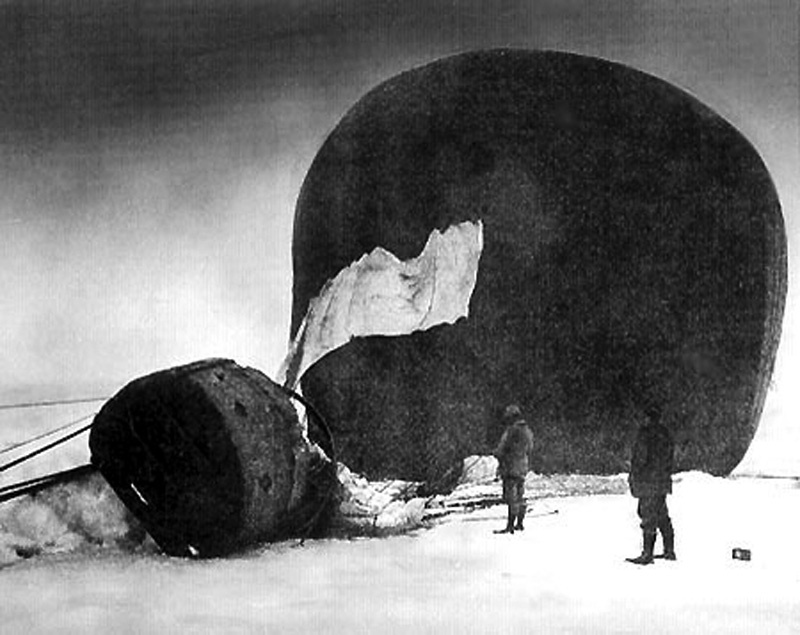 In fact, the balloon wasn’t even this good – Andrée had been secretly topping it up with hydrogen in an attempt to ensure his expedition wouldn’t be cancelled on the grounds of certain failure and probable death. 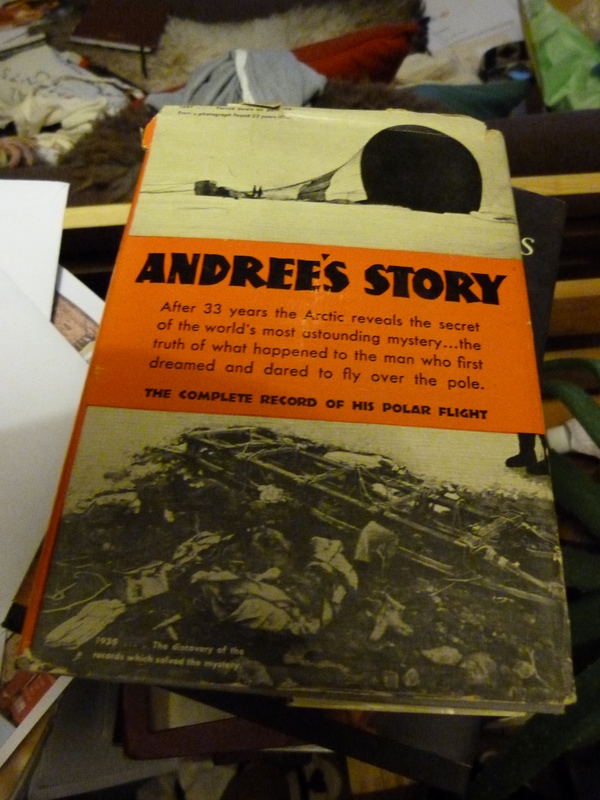 Luckily for Andrée’s two crew-mates, the wind blew consistently from the North all summer and the flight had to be abandoned. Andrée, Knut Frænkel and Nils Strindberg moments before take-off. 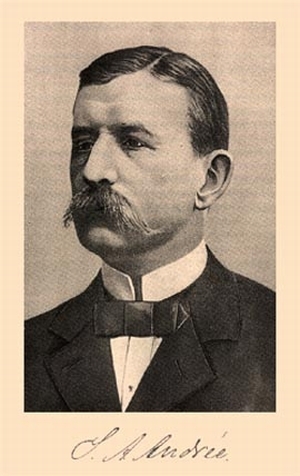 Andrée and his team were back in 1897, minus Ekholm who had proved intolerably realistic and unwilling to die in the name of science. On July 11th, the balloon ponderously took off from Svalbard. It was especially ponderous as it contained boxes of Russian and US money (in coins), bottles of port and champagne, and a large number of heavy towels. Last sight of the Eagle. After playfully dunking the basket in the harbour, most of the drag ropes had the good sense to detach themselves from the ship before it got too far out to sea. Freed from all that heavy steering equipment, and a good amount of valuable ballast which the crew had tossed over the side in fright, the balloon sailed high into the air and was blown merrily northwards. Andrée’s carrier pigeon was not only shot, but lovingly stuffed. Nothing was heard from Andrée, Strindberg, Frænkel or Örnen for the next 33 years. The only member of the expedition seen alive again was one of Andrée’s homing pigeons, which was promptly shot by the crew of the steamer on which it landed. Its message, sent two days in, reported good progress. The mortal remains of an expedition towel. 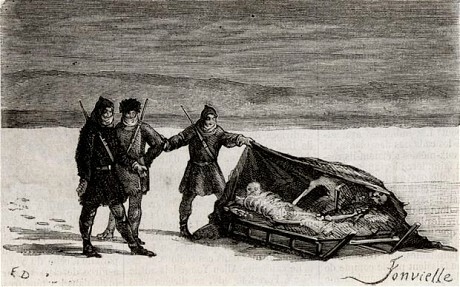 The remains of Andrée and his two companions were eventually found by walrus hunters in 1930 on the island of Kvitøya, just east of Svalbard. 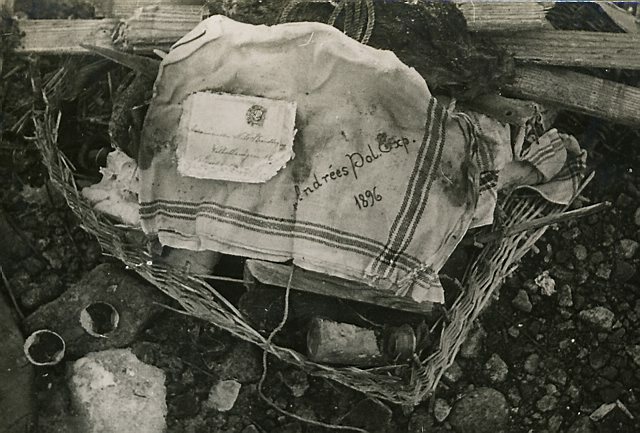 Andrée and half of Frænkel were found in the remains of their tent. Strindberg was found stuffed into a rocky crevice, where the others had haphazardly buried him. The camp was well stocked with food and littered with the equipment, sledges, tools and scientific instruments of the expedition. Happily for the Swedish Anthropological and Geographical Society committee, there was a great deal of evidence as to the fate of the expedition. As he died, Andrée had thoughtfully wrapped his diary in straw, oilskins and a jersey and tucked it inside his coat. Equally posterity-conscious, Nils Strindberg had done his photographic duty and 93 of his plates survived, along with a bundle of unsent letters to his fiancée. £23 and worth every penny. Since the diaries haven’t been digitised yet, I ordered the 1930 official account from a second-hand bookshop in Texas at great personal expense. A gentle landing allowed most of the expedition’s useless supplies to survive. It emerged that the balloon had crashed about two and a half days and 300 miles into the voyage. 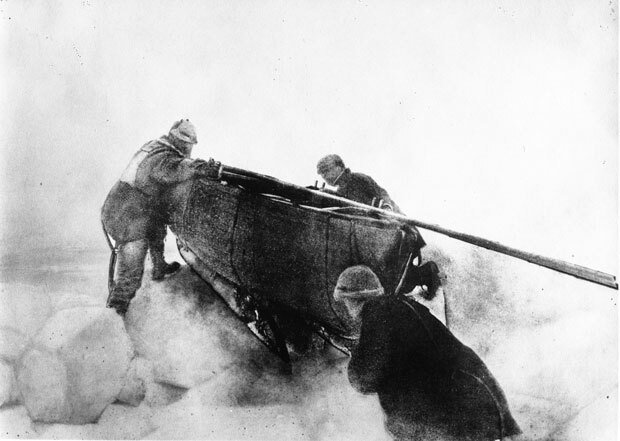 This was partly due to lost ballast and lost hydrogen, but mainly due to the weight of ice formation on the envelope – something Andrée had refused to consider possible, since the Arctic is almost always foggy and the temperature usually below zero. The party had then set off south, dragging their ill-designed sledges, collapsible boat and bulky food stuffs (mainly brought to act as additional ballast in the balloon) over the pack ice. Unfortunately the ice floe was unhelpfully moving in the wrong direction. 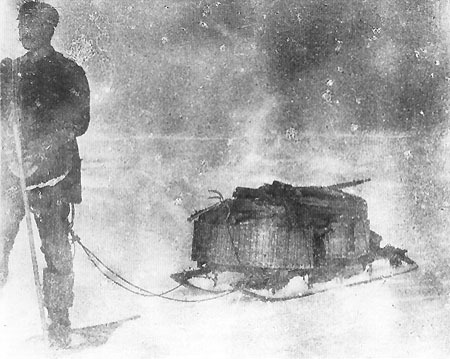 Nils Strindberg pulling one of the expedition’s poorly designed sledges full of port, raspberry sauce and towels. They gradually shed provisions, but on August 10th, they were still dragging a combined weight of 950 lbs, including some scientific specimens (like gull’s eyeballs) that Andrée had picked up on the way. By mid-September however, it was clear that they were literally getting nowhere and they prepared to winter on the ice pack. Fortunately, they had three guns and a number of seals and polar bears to keep them company. On 18th September, they celebrated the King’s Jubilee with a fine meal of seal steak and ivory gull fried in blubber, seal liver, seal brains, seal kidneys, Swedish bread, chocolate, gateaux aux raisins, with raspberry sauce, and a bottle of 1834 Antonio de Ferrara port, after which they sang the national anthem. This might have been connected to the party’s subsequent stomach cramps and diarrhoea, which prompted Andrée to add opium to their daily diet. The ice floe broke up on 1st October near to Kvitøya. After moving their supplies to land, they soon after died. None of them took the trouble to write down why. The most popular theory at the time was that they froze to death due to their flimsy tent, thin stockings and stylish but impractical Jaeger woolen suits. Frænkel in fact, insisted on wearing knickerbockers throughout, which possibly explains why his feet froze rather earlier than the others. Later theories include lead poisoning, polar bear attack or parasites from eating raw meat. 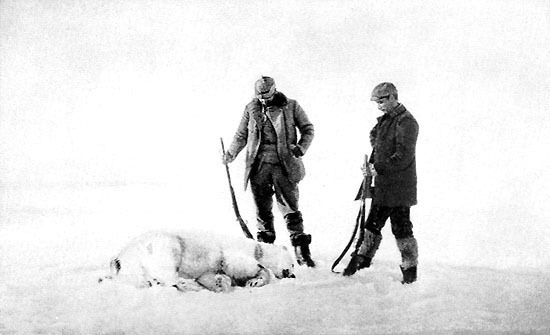 Fraenkel and Strindberg with a dead polar bear. Some blame their deaths on Trichinosis caused by eating raw bear. Others blame their deaths on being eaten raw by bears. The three bodies were given a sumptuous public funeral on their return to Sweden, at which King Gustaf V gave an oration, so perhaps for Andrée, it was all worth it. Like most national heroes, Andrée was subjected to the carrion-eyed attentions of revisionist historians in the 1960s, who regarded him as a jerk. They were probably right: he wasn’t unlucky – he was insanely optimistic and/or scientifically incompetent if he genuinely thought the expedition would succeed. Most of the Eagle’s flight was spent bumping along the ice. I like to regard Andrée as one of the victims of the Jules Verne age, when Great Undertakings, aimed at pointless and inaccessible goals, using far-fetched modes of transport became all the rage. He was probably assuming that when things went wrong he would be rescued by a tribe of pygmies or talking polar bears, and they would all laugh about it in Spitsbergen later. The story of the expedition was turned into the 1982 film Flight of the Eagle, staring Max von Sydow, which is not available anywhere for less than $100. Damn it. Here is a soppy music video featuring Strindberg’s expedition photos instead. 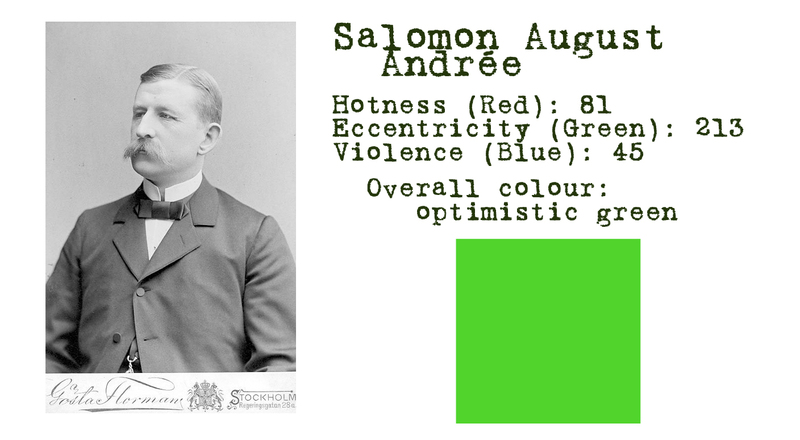 Hotness (red): 81 – a strapping young man, but the only lady Andrée was interested in was his dear old Ma. Eccentricity (green): 213 – so optimistic it hurt. A lot. Violence (blue): 45 – no real evidence of violence, other than towards Arctic wildlife. I think I saw this movie years ago. It featured live action and interspersed photos taken of the actual expedition. Another top-notch post! Keep them coming. Thanks! Maybe one day they will show Flight of the Eagle on TV. I’m always surprised these days when you can’t actually access certain media, not even through YouTube. Rather dashing moustaches. They really do look the part, the moustaches that is. As the air is cold over the poles, most of the time the cold air is sliding off the ice in a southerly direction, but that is a modern scientific perspective. Unfortunately, in 1897 they had yet to fully understand airflow around the poles as they only had a few years of proper data to go on. At the time scientists thought that the prevailing wind at Spitsbergen is from the South, when in fact it is from the North. You tube videos of the movie.